Chris and I celebrated our 26th wedding anniversary on May 17th. I wanted to do something special while we were in the valley on vacation with friends. A few months back, I contacted Lindsey at Continuum and requested a tasting and tour of the estate. Reel back time a few years… I discovered Continuum Estate while watching an episode of Wine Library TV on the internet. Continuum Estate was created by Robert, Marcia and Tim Mondavi (Tim and Marcia are Robert’s children). 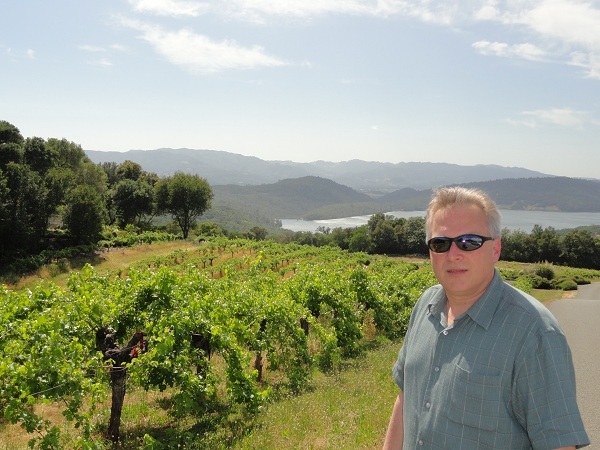 Tim Mondavi and his daughter Carissa were guests featured on the show. After watching the interview I was intrigued and knew that I would have to some day visit the estate. 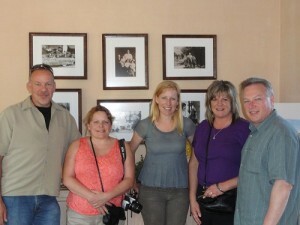 Our first visit to the estate was last May 2011. Since neither Mapquest nor Google maps do a decent job of navigating you to the winery, Lindsey emailed me the directions after scheduling a visit. The day had arrived when after lunch, we made our way to Pritchard Hill . The drive up was amazingly beautiful! Once we arrived to one of the estate houses, we were greeted by Lindsey who provided us with a fun and educational tour. The Continuum Estate is relatively new. She explained that they plan on digging tunnels and create a hospitality and barrel room. 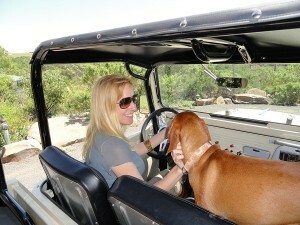 After we enjoyed some time touring the property in a rugged Jeep, we returned for a tasting in the estate house. After the tour and tasting was done, I knew I had to come back the next year to see the progress of the estate. We had no idea that when we arrived this year for our estate tour and tasting, that it was going to be very special! We approached the estate after enjoying a picnic near Lake Hennessy. There is a nice spot to park and overlook the scenery although there is a sign posted “No Picnics”, we were discrete. It puzzles us why there is the no picnic sign near a convenient trash receptacle. We finally made it to the Contiuum Estate and drove to the house. As we were exiting our suburban Lindsey again was the one who greeted us. We could see that she and another gal were setting up a picnic what looked like a lunch for another group. As we introduced our friends Dave and Heather to Lindsey, we were pleasantly surprised to see Carrisa Mondavi and her dog Bayla walk over and greet us. 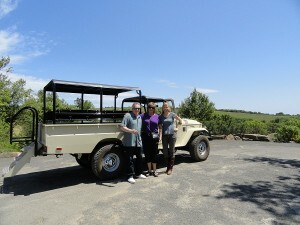 As luck would have it, Carrisa was going to be our estate guide and host us for a tasting that day! We began by heading into the estate house for a brief conversation about the winery, the history of the Mondavi family (great Minnesota roots! ), and a review of some drawings of the final plans for the Continuum Estate. We finished the conversation and Carrisa escorted us to a new guide vehicle. She was really excited as today we were one of the first to ride in the brand new tour vehicle for the estate. Apparently, we were the second group to take a ride with her that day. Her dad Tim and a friend having been her first earlier. You could really tell she was stoked driving the truck! Bayla was at her side as we headed out for the tour. 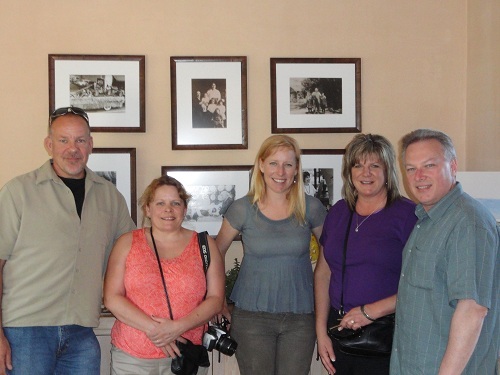 The first stop was a visit by the tasting room that was being remodeled. There were three colors on the exterior. It sounded like the color they selected will match the estates soil. While viewing the other color samples, we agreed with Carissa the color that matched the soil was a perfect match. We continued the tour and drove by some Cabernet Sauvignon vines, and at the bottom of the hill were Pertit Verdot vines. The vines had not flowered yet but it sounded like it would be happening very soon. Heading up the hill we could see some very young vines (babies). We concluded the estate tour and headed back to the house. After a quick brake, we all headed to a very large table for our tasting. Carrisa was seated at the head of the table with me to her right and Dave on the opposite side. There was a bottle of the 2009 Continuum sitting next to a filled decanter. I’m assuming the wine was decanted at least thirty minutes. Also on the table was a nice cheese (Mezzo Secco and San Andreas) and bread platter with Calvestrano olives. We also were introduced to the 2010 Continuum Estate Olive oil. 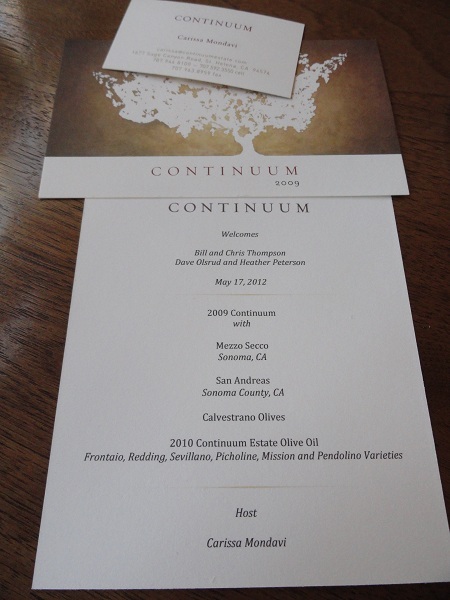 I was pleased to see where the table napkin is located, was a card with our names welcoming us to Continuum Estate! We started a tasting with a Cheers! The 2009 Continuum was amazing. I wish I would have grabbed my tasting sheet. I can tell you the 2009 Continuum is a very elegant and well balanced wine. Even though Heather is not a red fan, she too enjoyed the balance and tannin structure. The finish was smooth and long. The aroma was quite pleasing. I could remember dark fruit and a light hint of cocoa. I feel you could drink it now or cellar it for many years. I have two vintages now and can’t wait for the third. I plan on a vertical tasting and review in the future. We concluded the tasting and headed out back. The views past the tasting room door is stellar. You can see Lake Hennessy and other mountain tops. Carrisa was very willing to participate and take as many pictures through out the day. You can tell she loves what she does and is passionate about Continuum winery and her heritage! I thoroughly enjoyed my time with Carrisa and look forward to visiting the Continuum Estate again next year. We loved to see the progress and will definitely attend the first release party when the estate is fully operational. As we were about to leave, Carrisa’s brother who was hosting a group from the east coast came over to great us. I made sure to mention we would love to participate in a wine dinner next time Continuum was in Minneapolis. Carrisa and I exchanged business cards and I hope they make it this year! I also hope to get a chance to meet Tim Mondavi next time we are at Continuum next year. And of course, I want to see Carissa again and get caught up too.